The Itaipu Dam is a large hydroelectric dam that is situated on the border between Paraguay and Brazil on the Paraná River. It is named after an isle that was close to the damn. Itaipu translates to “the sounding stone” in English from the unique Guaraní language. The dam is the biggest functioning hydroelectric facility in terms of the amount of power generated. Two countries, Paraguay and Brazil, worked together to build the dam. In 2008, the Itaipu dam produced a record amount of ninety-four terawatt hours of energy, which is nearly ninety percent of Paraguay’s electricity usage, or about twenty percent of Brazil’s energy usage. In 1994, this dam was picked as one of the Seven Wonders of the World in the modern category. In the 1960’s, the Iguaçu Act was agreed upon by the Paraguayan and Brazilian governments. The agreement’s terms expire in 2023, and this has caused great concern in Paraguay because Brazil has not been open to any new renegotiations. In 1970, the IECO and the ELC Electroconsult companies were awarded the construction contract to build the dam. Work started in February of 1971. Before the construction started, approximately ten thousand families that were living next to the Paraná River had to be relocated. In 1978, the route of the Paraná River was changed to create a dry area to build the dam. In October of 1982, the dam’s reservoir area was built and the canal’s side gates were closed. All through this time, heavy flooding and rains aided in filling the reservoir and the water level went up by 328 feet. In May of 1984, the first energy generation unit began running in Itaipu Dam. It took about seven years to have an additional eighteen units installed. The final generation units were completed in September of 2006. 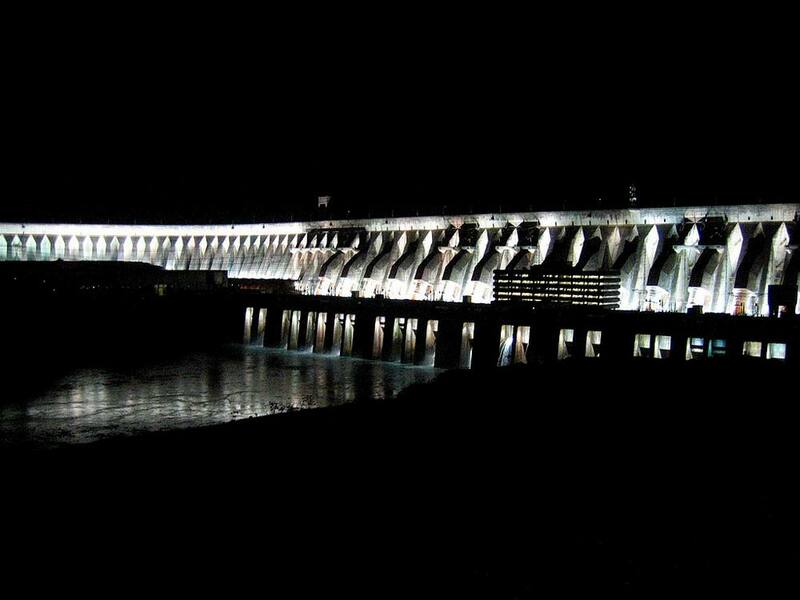 In March of 2007, the overall capacity reached fourteen gigawatts and completed the dam’s power plant. This capacity increase lets eighteen power generation units run continuously while two can be closed for maintenance. As a result of an agreement clause between Argentina, Paraguay and Brazil, the absolute maximum number of units that are permitted to operate at the same time cannot exceed eighteen. The nominal power rating for each power unit (generator and turbine) is seven hundred megawatts. Although, the head (contrast between river level and reservoir level) that normally occurs is greater than the originally designed head. The energy available for each generator surpasses seven hundred and fifty megawatts, fifty percent of the time. Every turbine creates around seven hundred megawatts. In comparison, all of the water from Iguaçu Falls only has the capacity of two generators. In November of 2009, a storm caused damage to the energy plant and transmission was completely disrupted. This triggered large power failures in Brazil and Paraguay which completely blacked out the country for fifteen minutes. São Paulo and Rio de Janeiro were plunged into darkness for almost two hours. Nearly fifty million people were affected by the power outage.